FAQ | Portside Paddle Co.
All classes gather at the small hand-launch ramp on the West side of the Santa Cruz Harbor. Please note there are 2 ways to access the harbor, depending on if you are going to the West or East side. Plug in “Mariner Park Way, Santa Cruz” into Google maps. Follow Ocean St. then turn left onto Soquel Ave. Turn right onto Seabright Ave.
Take Seabright all the way towards the ocean. Head towards the back of the parking lot near the bridge. Santa Cruz is a tourist town and traffic can be heavy during summer months. Please give yourself plenty of time to get to the Harbor and secure parking. 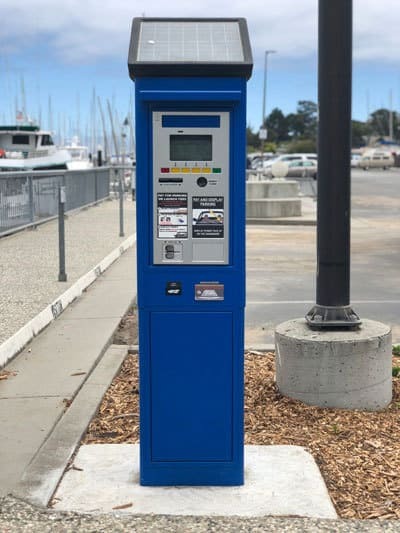 Parking at the Mariner Way launch ramp is controlled and enforced by the Santa Cruz Harbor. Please see the below map and inset photos of our launch location and locations of the “blue box” parking payment stations. Park in a Visitor parking stall and obtain your daily parking permit from one of the blue parking kiosks. Kiosks are located near Dock FF and near the Harbor entrance (near Aldo’s restaurant). Parking kiosks accept cash or credit cards. Take the parking slip and put it on your dashboard. We keep it simple. We charge $70 for any of our 2 hour paddle tours with all gear and instruction included. That’s it. No hidden fees, and no extra charges for a wetsuit. Conditions will vary day to day, but a good place to start is with a swimsuit or board shorts with a lightweight, quick dry upper layer such as a rash guard, neoprene top or water-proof windbreaker. Cotton is not a wise choice. Remember, with Stand Up Paddling, especially in the calm waters of the Santa Cruz Harbor, you do not spend extended time in the water (we’ll see to that)! With that said, we proudly offer O’Neill spring wetsuits (to the knees and elbows) at no extra cost. Over the years, we’ve found these suits to be the ideal mix for those that want the comfort of a wetsuit but do not want to overheat while paddling. Of course, you’re welcome to bring your own wetsuit. If you have specific questions about the anticipated weather, and relatedly clothing selection, on your event date, please call us – we’re happy to work to make your experience perfect! If you have specific questions about what to bring, please call us – we’re happy to work to make your experience perfect! We serve all able-bodied persons, aged 13 through “you name it” who can swim and possess the minimum fitness required to stand up and remount on a wide, stable tour board. We’ve new paddlers in their 70’s get hooked, enjoy a whole new way to get outdoors and even participate in distance and race events! If you have physical limitations, or paddlers under the age of 13, please contact us to see if we can accommodate your needs.